Though it seems early in the season, the comparative warmth, the sunshine, the open water showing on the lake, and a collection of comestibles in the refrigerator whining about perishability combined to persuade me toward a picnic. So Stella the Wonder Dog, Clarence the Corkscrew and I talked about the possibilities. Clarence elected to stay in; he's a servant type who, once his work is done opening a bottle, retreats to avoid intruding into what might be private conversations. So we opened the bottle indoors and Stella the Wonder Dog and I wandered down to the beach, where earlier in the day I had positioned a picnic table for just such an occasion, not at all realizing I'd be the one taking advantage. But so it was. We were joined for the first ten or twelve minutes by an hypothermic muskrat who sat motionless on the edge of the lake ice. At first I thought he must be dead, he sat so still, but when Stella the WD decided to go swimming, he surreptitiously slipped underwater and escaped. On the plate you will observe a bit of sharp cheddar to the left, homemade venison summer sausage center, BellaVitano cheese laced with Merlot on the right, some Kalamata-olive-imbued flatbread, and on the far end, a couple squares of Ghirardelli Sea Salt Chocolate. Not bad, and a little Alamos Malbec to wash things down. "It's not for nothing that Kafka spoke of literature as 'a hatchet with which we chop at the frozen seas inside us.' Nor is it an accident that the technical achievement of great short stories is often called compression -- for both the pressure and the release are already inside the reader. What Kafka seems able to do better than just about anyone else is to orchestrate the pressure's increase in such a way that it becomes intolerable at the precise instant it is released." One of the things I've learned about this particular essayist -- Wallace is his name -- is that you have to, have to read the footnotes. In great detail. Most of the relevant content, and the vast majority of the humor, is contained in the footnotes. And it's delightful. "The above ¶ is motivated by the fact that this reviewer nearly always sneers and / or winces when he sees a phrase like 'historical context' deployed in a piece of writing and thus hopes to head off any potential sneers / winces from the reader here, especially in an article about felicitous usage. One of the little personal lessons I've learned in working on this essay is that being chronically inclined to sneer / wince at other people's usage tends to make me chronically anxious about other people's sneering / wincing at my usage. It is, of course, possible that this bivalence is no news to anybody but me; it may be just a straightforward instance of Matt. 7:1's thing about 'Judge not lest ye be judged.' In any case, the anxiety seems worth acknowledging up front." The chocolate was delightful, and the hint of sweetness in the Malbec really eliminated the pressing need for further dessert, so I'm not sure why I'm even thinking about frozen blueberries and cream. We'll see. Picnics, as everyone knows, are a matter of extremes. They are the most romantic possible meal on God's green earth, partly because they are usually enjoyed reclining right on God's green earth with perhaps a blanket for insulation or for the illusion of cleanliness. 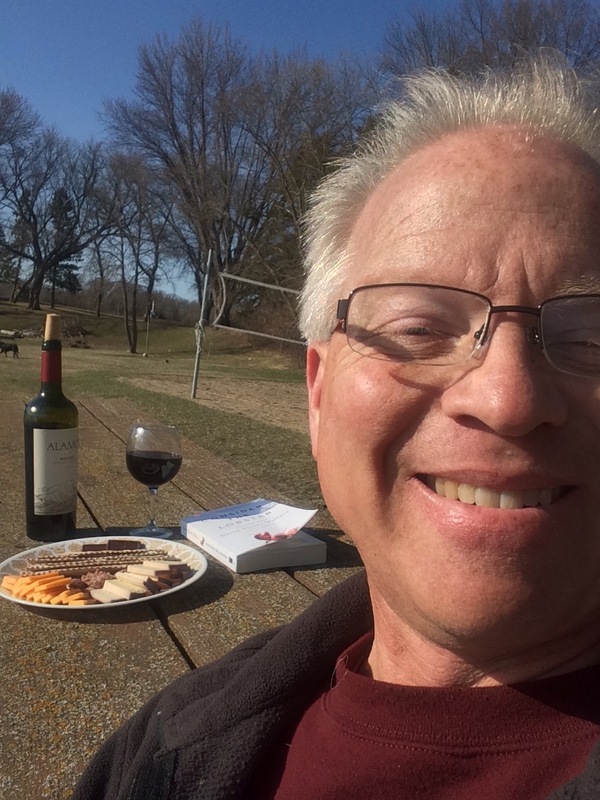 (I know I was cheating by using a picnic table, but since the frost has only just gone out, the lake is still full of ice floes and hypothermic muskrats, and the grass is only beginning to think about turning green, I hope I might be forgiven.) Picnics are that odd combination of romance and ants, fine wine, sand in your potato salad, fresh fruits and vegetables and pan-fried chicken. So I felt like I had accomplished something to get Kafka, Stella the Wonder Dog, a good bottle of Argentinian wine, a handful of excellent musicians, and St. Matthew all into the conversation. 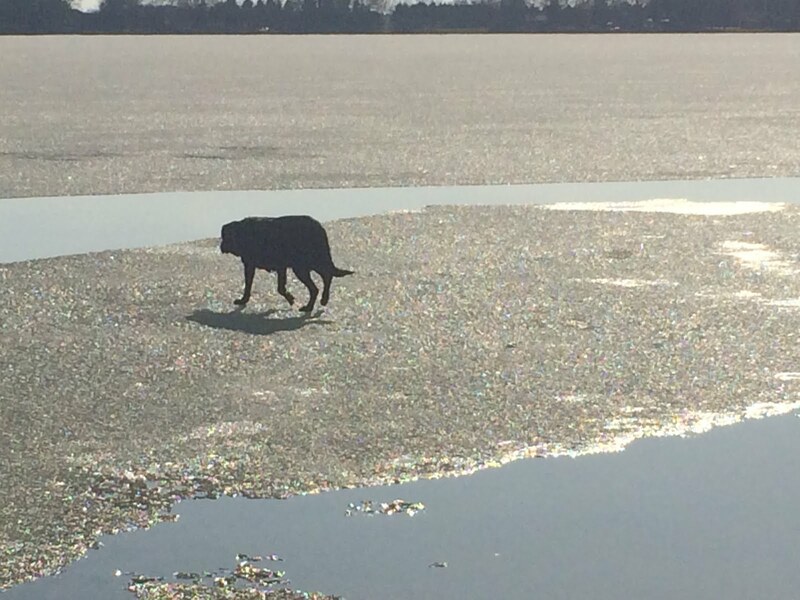 About this time, Stella the WD decided to see if the ice would support her weight. She waded out to an ice floe -- the open water did in fact re-freeze this morning, though the weather service said the temperature only reached a low of thirty-five degrees, but the laws of physics being what they are someone was wrong and I don't think it was the lake -- and clambered aboard her own very large paddle board, sans paddles -- and proceeded to wade off the far edge into about five feet of water. 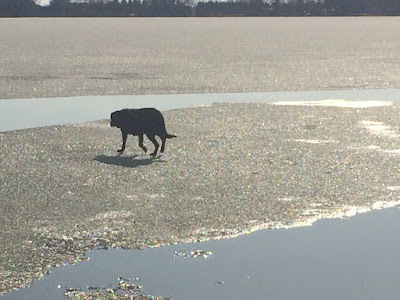 Stella stands about two feet tall and couldn't reach the bottom and she thought maybe this would be the end of her, as she couldn't get her back feet aboard her ice floe. I was more than a little concerned I -- the dog-sitter -- might be ethically compelled to wade in and rescue her, which then got me wondering, would the floe bear my weight, though I'm probably three times Stella's tonnage? Fascinating thought ... interrupted by Stella finally making a herculean effort to get herself up onto the ice again, shook it off like a good Labrador, and proceeded to repeat the whole process as if for the sake of scientific veracity or something. I realized that for a Lab, this is fun, and went back to Kafka and BellaVitano. Extremes. When the wind went down, or switched to the southeast so I was sitting in a sheltered nook, the sun beat on my polarfleece jacket like a sledgehammer and I began to doze in the warmth. Turn the wind a few degrees southwest so it was coming in off the ice in the bay, or bring that breeze up above about ten miles per hour, and suddenly I was feeling a kinship with that poor, suffering muskrat and thinking about going inside to find a blanket and a fire. I hope you get to enjoy some excellent, romantic, messy, delightful picnics this season that get you thinking about the paradoxes and the extremes of life, and celebrating all of it. * One might legitimately ask why I keep this unreasonably lengthy song on a favorite playlist. This is in fact a question I've asked myself many times. Thing is, if the song is True, and God in fact won't relent until he has every last shred of us (an oft repeated refrain in the song) then it might be important to be reminded of this. And so I have kept the song in my rotation precisely to remind myself of the truth that God wants every last bit of me, even the part that resents a fifteen minute long song. ** "Das ist komisch" is German for "that is comical." 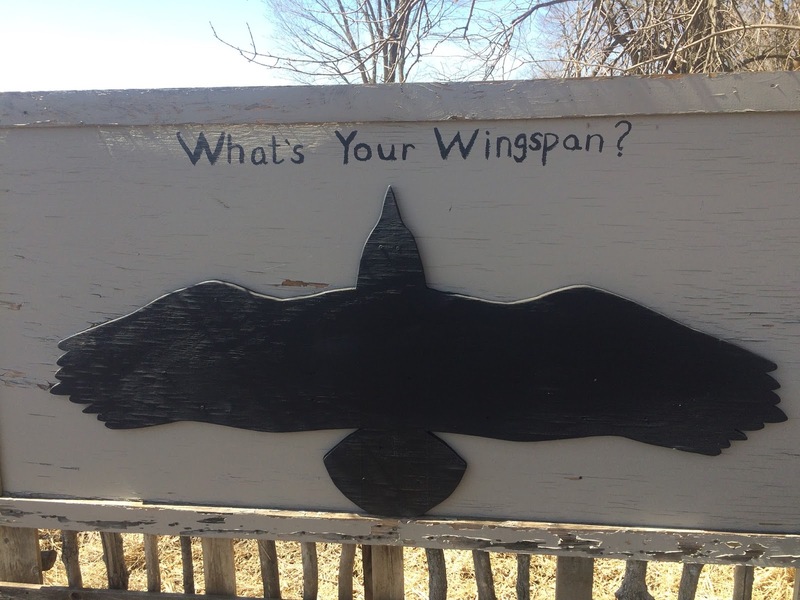 Hopkins uses the flight of the windhover, a kind of hawk, to point toward the glory of Jesus. I've always loved the language in this poem (as in most of Hopkins' work), the careful, beautiful, exciting use of words to describe the grace of the hawk's flight. Hopkins is a master at that kind of thing, and he very intentionally lets the emotion of his description of this bird's aerobatics point beyond itself toward the beauty and grace of Christ. There is something, I've been thinking lately, in the grace of a flying bird. I've watched the V's of geese high over the landscape this spring, the late-evening swooping of swallows, the all-or-nothing swoosh of ducks coming in to land on newly open lakes, and just today the graceful, heavy flight of a loon over New London itself, and the roller coaster comings-and-goings of chickadees and woodpeckers at my feeders. What a miracle is flight! It is not hard to picture the Wright brothers and many before them watching the miracle of birds flying, imagining what it would be like to leave the ground themselves, until that fateful day at Kitty Hawk they actually left the ground in intentional, exuberant flight! There is another kind of flight, isn't there, in the daily living of human beings. People around us, perhaps without they themselves fully knowing it, take wing and inspire us to fly. Do you know people whose lives are so filled with excellence, people who may not even realize how you watch them, heart in your throat, as their words, their actions, their loving, their living soars above mediocrity into excellence and you delight in watching them, in wordlessly cheering them on? We all need these inspirations in our lives, and how privileged we are when those we are closest to, those we love the most, inspire us in this way! Almost two thousand years earlier, Irenaeus had the same idea as Hopkins' windhover when he said, "The glory of God is human beings fully alive." Adam and Eve in the garden were imbued with the grace and dignity and majesty of God in a way that, though marred by sin, is not wholly lost. That grace and majesty, that dignity, continues to come through in the everyday glory of human beings fully alive. And when we see those we love fully alive we come alive in a way ourselves. 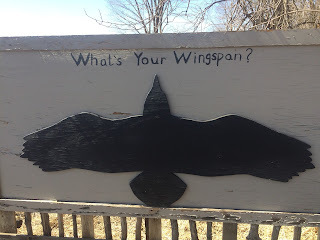 We begin to spread wings and take flight, maybe only in short hops and jumps at first, extending weak, fragile wings that begin to gain strength and substance the more we use them until we begin to fly, to soar upward into the beauty and grace God intended for his children. The Greek story of Icarus, of course, is all about this flight and the dangers it poses. Icarus and his brother Daedalus use wax to fasten feathers to their arms and bodies in order to fly, and they soar upward -- but their father cautions them not to fly too high, because the sun will melt the wax. Icarus disregards his father's warning and falls from the sky. The voice of caution says flight is dangerous. Careful restraint is necessary. And yet we are somehow fascinated by those who dare to take to the skies and soar beyond us. We recognize our kinship with flying things, and our hearts' desires to spread our wings and reach for the heavens is a God-given desire. While the voices of cautionary reason have their place, it's a good day to celebrate those who soar above and beyond us, who remind us that we are created for a glory that goes beyond staring enviously at the sky, that we are created to spread our wings and reflect the glory of God -- and even if they don't always realize they're doing it, those in our lives who cause us to look upward are gifts from God who spur us toward taking flight ourselves. Every morning I begin my day reading the Bible (a psalm a day lately, #19 this morning) and Oswald Chambers' excellent and often challenging meditation from My Utmost for His Highest, along with the Daily Texts. That is more or less my spiritual breakfast each day, along with time in conversation with God. The great point of Abraham’s faith in God was that he was prepared to do anything for God. He was there to obey God, no matter to what belief he went contrary. Abraham was not a devotee of his convictions, or he would have slain Isaac and said that the voice of the angel was the voice of the devil. That is the attitude of a fanatic. If you will remain true to God, God will lead you straight through every barrier into the inner chamber of the knowledge of Himself; but there is always this point of giving up convictions and traditional beliefs. Don’t ask God to test you. Never declare as Peter did — I will do anything, I will go to death with Thee. Abraham did not make any such declaration, he remained true to God, and God purified his faith. Notice here what God's end game is. He wants his people to know him. As he later spoke through Isaiah, his long-term desire when God finally has his way with this world is that the earth shall be full of the knowledge of the Lord as the waters cover the sea. N.T. Wright loves to point out that this is such a rich metaphor, because in fact the waters are the sea. God wants every atom in his creation to vibrate with the knowledge of him. Psalm 19 this morning makes this explicit, and as I watch the sun east of my window rise above the treeline out of the misty clouds this morning, I'm reminded that it, too, is preaching not God's rules (though those are important, as the psalm makes clear) but the identity of God himself, "like a bridegroom leaving his chamber." This thought -- that the knowledge of God is his goal for us -- is revolutionary. Most of us are so willing to settle for a set of principles, a set of laws. Those principles can indeed reveal much of the heart of God. But what to do with Chambers' assertion that living by principle, Abraham would have indeed made that downward stroke with the knife, killed his son, and acknowledged that the tribes among whom he lived who practiced child sacrifice as a matter of course because their gods commanded it, were in fact correct? God calls Abraham right to the edge and beyond, calls him into what has to be horrifying for any of us to read, if we allow ourselves to get into the story at all. God calls Abraham to actions that would later inspire Isaac as an adult to describe his father's God as "the Fear." If any of us took the actions Abraham took we would be locked up these days. God's concern seems to be less about a set of rules and more about a relationship. And when the rules we follow become an obstacle to a deeper relationship with God, he will sometimes break all kinds of laws for the sake of his love for us. I think Chambers is right that at such times -- and we must be careful to diagnose such times accurately -- "if we keep true to God, God will take us through an ordeal which will bring us out into a better knowledge of Himself." To be clear, in such times the breaking of God's laws is a very real, very dangerous thing, and it may carry devastating consequences. But God will bring us through an ordeal (remember Job? Remember the Israelites being led off to Babylon?) that, rising from the crushed ashes of our brokenness, will give us a new insight into God's heart. I've often heard people speculate about Jesus' story of the Prodigal Son. It's interesting how we so often make that story about the conversion of the younger son, when Jesus' point was so obviously, by context and by the whole structure of the story, to focus attention on the plight of the older son. What happens next? The older son is left standing on his principles outside the party, and the tragedy of the story is that it has finally become clear that he has completely missed his father's heart. The father wants him to come in and join in the outlandish dancing and feasting, the outpouring of all the father has for both his sons -- but the elder son stands outside, saying, "This isn't the way the world is supposed to work!" Will he drop his principled pride and come inside to dance and eat? Or will he slink off to be right in his isolation and bitterness? That's the direction of Jesus' narrative. If we start reading the Bible with this idea in mind -- that God's ultimate goal is for us to know him for who he really is -- it will change the way we read his word, even in the smallest details. For example, a few days ago when I was in Psalm 17, I was deeply troubled by verse 14 as I read it in the ESV. It seemed to be saying, contrary to what the rest of the Bible consistently says about God, that somehow God provided children -- "you fill their womb with treasure" -- to those who lived contrary to his word. How to reconcile this with what the Old Testament consistently says about children being a blessing from the Lord, a joy for the righteous, etc.? I got stuck there and was trying to pray my way and read my way into understanding. Was this a new place for me to learn something about the character of God I had missed? The deeper I dug, the more it bothered me because it seemed to contradict so much in the rest of the Bible. At that point I noticed a footnote. Now, there's a principle in biblical translation that when there are variants in the texts, as a rule you should choose the one that is more difficult. That, I think, is what the ESV translators have done here. The variant reading, included in the footnote, in this case says that the text might read "As for your treasured ones, you fill their womb ..." And the text goes on from there to make complete sense in the context of the rest of scripture. While it's not a huge point, I have come to believe that in that particular case, the footnote is a better reading because it reveals the heart of God consistent with his word. So what about the ordeal? Is it accurate, plausible, biblical to think that God would put his people through a crisis in order to reveal himself to them? Is it possible that in this crisis he will break down the traditions we've created, the values we thought encapsulated the good, obedient life, in order to lead us into a new vista of knowing him and living in his character? Start looking for this in scripture and you will find it everywhere. Abraham's life from start to finish, Joseph languishing in an Egyptian prison, Moses herding sheep in the desert after a well-intentioned murder, David hiding in caves after he's been anointed king, the Israelites being led off into exile and their temple destroyed, the law-abiding Pharisees castigated by the Son of God as whitewashed tombs whose old wineskins can no longer hold the new wine of the Spirit of God, the churches in Revelation that are threatened with death and destruction because they've missed the character of God ... everywhere. The problem with living by the rules is that while it's good for kids and new believers (this is also a biblical teaching) it won't take us to spiritual maturity. (So much of Paul's argument in Romans centers around this idea, and it's everywhere in scripture, both Old and New Testaments.) Our rule-bound lives may well prevent us from experiencing God for who he really is. He longs to pour his love into our lives, to fill us as the waters fill the sea, so that our entire existence, and that of all his creation, becomes an expression of his character. Just a brief note to apologize to regular readers for my tardiness -- I have had a busy week, with a ton of work projects, as well as some creative endeavors of my own. Besides all that, spring is rapidly springing here at Decision Hills, and that opens up possibilities, though the ice on the lake is still thick! I actually went bike riding today for about six miles just to work the kinks out. That was wonderful. That said, there should be more ponderings coming to surface here shortly. In the meantime, get outside and enjoy! Mystery solved. Looked out the window a few minutes ago and saw the culprits. (The fresh tracks had already been an obvious clue.) The fawn, on the right, came in first past my study window and I belly-crawled across the living room floor just in time to see the very pregnant doe on the left come walking in. Between the dog nose prints from this weekend on the inside of the glass, and the deer-prints on the outside of the glass, it's a mess. (I don't think they were made at the same time, but ...) Kind of fun to watch, all the same. Seems like the deer really like the latest variety of birdseed I bought. I've been thinking a little lately about wine and wineskins. Jesus talked about this in Mark 2, among other places. Seems like Jesus was saying that the "new wine" of relationship with him, of community focused on him, has to be placed in "new wineskins" -- new practices and structures. To oversimplify, the Jesus-following church was going to look different than its Jewish roots. I think that we have a similar problem when we think about "going to church." What most of us have experienced as going to church has little to do with what the New Testament describes as church. Not only are the wineskins radically different, but over time those wineskins -- the structures we put in place to do church -- begin to change the wine itself. For example, for most of us, "going to church" involves getting in a car and driving to a building that has seating for a large number of people -- maybe a hundred, maybe a thousand, maybe more. We enter that building and are likely handed a booklet including a template for the worship experience. We go into a sanctuary and sit in rows of seats or pews that keep us more or less passive, facing a platform from which professional leaders sing, play, perform, preach, and pray. We sit in place as an offering plate or bag or bucket is passed by us and we may or may not put a contribution into it. Eventually the experience ends, and we file back out to our cars and drive home. This, we think, is "going to church." Such an experience has very little to do with the New Testament vision of the church. What kind of Christianity does this kind of going-to-church produce? Passive. Professionally led. Low commitment. Biblically illiterate. While there are glorious, glowing exceptions to these harsh words, look at the tendencies of the western church across North America, and you'll see my point. Mostly the glorious, glowing exceptions happen in places where this lowest-common-denominator of going to church is augmented by faith lived out in the home, mission acted out in the neighborhood, scripture studied and discussed and prayed over in a spiritually hungry group of people. If you're curious about this, I had the privilege of preaching about some of it at The Open Door this morning. We were scheduled to have a great student choir called "On Call" leading worship but the blizzard prevented that, so Ryan and Daidre put together a great acoustic worship set at the last minute. If you want to skip past their excellent music, the sermon starts at about 24:00 and my final thoughts at 1:02:00. Here's the link to the sermon. This morning I was reading a meditation written by John Piper, the well-known preacher and teacher. I don't always agree with Piper, and sometimes reading his material provides me with a theological wrestling match, sort of like sparring with a friend or colleague. It sharpens me, because I respect Piper's biblical knowledge and the fruit his life has borne, even if we disagree on some of the minor points. That's sobering. He goes on to quote the New Testament book of Hebrews (5:8) which says that though Jesus was "a son" -- in other words, in the position of an heir, full member of the household of God (just as Jesus' followers are sons and daughters through our adoption into Christ Jesus, his death and resurrection), as well as being uniquely positioned as the "Son of God" -- "he learned obedience through what he suffered." Piper rightly points out that this same book, Hebrews, declares that Jesus never sinned (4:15). So it's not saying he was disobedient and then learned obedience, but rather that the fullness of the experience of obedience was produced in Jesus' earthly life through suffering. Piper says, "It means experiencing depths of yieldedness to God that would not have been otherwise attained." While your heart may have been turned to Jesus for a long time, your ability to act in obedience has not been mature. This has certainly been (and continues to be) true for me. This is part of what Jesus meant when he said, "The spirit is willing but the flesh is weak," or what had Paul tied in knots in Romans 7. As an example, for my entire adult life I have been eager to have strong relationships that reflect the love and glory of God. In my own vernacular, my shorthand for this desire is that I long for a life built around love. That desire is not new; I remember dreaming in college about what I wanted my adult life to be, and the shape of it was exactly this -- I longed for a life built around love. I believe this is a right, good, God-honoring desire. Trouble is, my understanding of love and a life built around it was immature and partial, and my ability to act to build my life around genuine, enduring love was broken at best. So for decades, while pursuing the worthy goals of building a marriage and a family and a career that glorified Jesus and built the kingdom of God in some way, my own brokenness and weakness prevented me from making some of the needful hard decisions in obedience. Fact is, I thought I was being obedient, and I looked for all the world like a husband, father, worker who was trying to do things right -- because that's exactly what I was. However, my obedience didn't have enough depth. I needed to set hard limits at times, and instead I gave people cheap grace. I needed to be an advocate for myself, and instead I believed I was called to give up my needs, just one more time. I needed to hold people near me accountable for their hurtful actions, and instead I forgave as best I knew how, but inside I seethed with resentment, and thought I was being loving. I needed to walk away from dysfunctional conversations and cut them short, and instead I just put on an impassive face and tried my best to endure. These specific examples may or may not be the place God is calling you to deeper obedience. But he is definitely calling -- especially if you are suffering. Eventually my shallow obedience was not enough, and much that I had tried to build came crashing down. While it's tempting in suffering to blame another person or another system (because they're certainly broken as well) that doesn't bear any good fruit. And make no mistake, I suffered for my own actions, or my own inactions. It is an ironclad truth that whatever you plant, that's what you're going to reap. But the suffering I reaped through the crash has begun to teach me a deeper, richer obedience that looks different than what I thought obedience looked like. I'm learning to acknowledge and advocate for my own needs. I am learning to say no to dysfunctional people and systems. I'm learning to walk away from destructive conversations. I'm learning that grace is costly, both for me and for those I love. I'm learning that sometimes I need to take action to call a stop, to make an end, to set and enforce a limit. And make no mistake, that can be painful. This deeper obedience lies in tension with, and sometimes contradicts, the "Minnesota Nice" I absorbed growing up, which (in reality) is so often simply an impulse to avoid conflict and avoid pain. There are deep, deep confrontations inside me where the truths God is teaching me stand in direct opposition to the long-suffering passive-aggressive behaviors I learned growing up. There were many lessons I learned in those early days that still serve me well -- kindness and patience and careful thought and hard work and many more. But sometimes it is right, deeply obedient, to call a halt, to say "no," to walk away, even if it looks in the short term like those choices might cause more conflict and offend people. Sometimes it is deeply obedient to know your own needs and name them out loud and act as your own advocate, even if doing so looks terrifying at the time. I look back at the last few years and realize -- and this is uncomfortable -- that without the suffering I've endured (including the self-inflicted parts) I would never have learned these lessons. Too much in my life was wrapped around my old ways of acting, believing, coping. It is a severe grace of God to come at times like an avalanche and sweep away much that seemed solid. But it is also God's mercy and compassion to rebuild on foundations swept clean. More than ever, I continue to long for a life built around love. In this challenging season, I am growing into a deeper understanding of what that requires of me. Have you ever been frustrated with God's timing? I have. So many times. I'm thankful I have many, many stories I can look back on to verify that God's timing is perfect. He knows far better than I do when things should happen and how the amazing, intricate web of events that make up our lives should be coordinated. This morning I've been taking advantage of the snow to handle some administrative details, surfing through old emails, planning future projects, doing my best to manage my work and my life and to communicate well. If the day stays like this, I'll add a few paragraphs to the manuscript I'm working on later. Eventually I'll need to go out and clear some snow, but there's not much point in that until the flakes slow down later this afternoon. So I'm doing indoor work by my window, sipping my Caribou Mahogany coffee, listening to John Mayer explain why he's not going to L.A. anymore. The snow falling fast through the oaks and cedars looks like a snowglobe, like a perfectly gorgeous late November or early December day. And earlier this morning there, out of the trees across the meadow, up into my yard, came three deer -- Momma and the almost-grown twins. 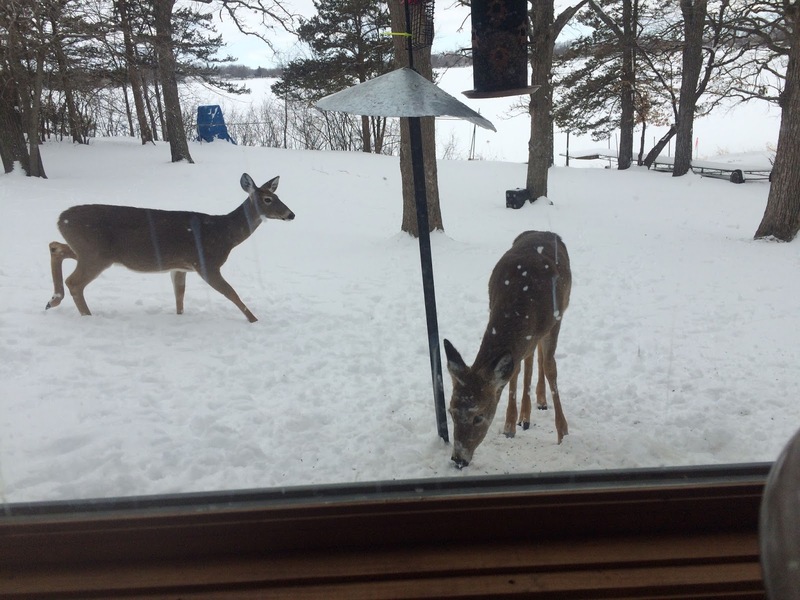 It was quite clear that they don't mind the snow at all as they paused to browse on the buckthorn at the bottom of my yard. Doesn't look much like that outside my window right now. Yes, last year March saw days in the 80's and spring came remarkably early. That doesn't mean God needs to make it happen just that way this year. Like those twins appearing in my yard this morning, God's promises are good, and he has good reasons for his timing. There will come a day his voice will speak clearly and he will say, "Ready? NOW!" and if we're paying attention, it will be time to act, time to move, in an attitude of submission to God's sovereignty and worship of his glory. Until that day, remember that for Jesus' followers, waiting is never a passive thing. If God has you in a period of waiting right now, this is critically important. We wait actively. Waiting is a time to prepare, time to get ready for that day when God speaks his "Now!" Like the warming earth under the snow, like the sap rising in the frost-encrusted maples, like the deer calmly browsing through the buckthorn, waiting is an active time. The fledgling church in Acts 1 was waiting, by Jesus' command, for the coming of the Holy Spirit. Yet in that throwaway chapter, they gathered together to strengthen relationships, they prayed, they dealt with leadership issues, they immersed themselves in the scriptures, so that when the Holy Spirit showed up, they were ready to leap forward in obedience. God's timing is perfect. Trust him, and do what can be done in these days while you wait for spring.